Earlier this month, a six-year-old Rottweiler-cross named Bless earned the unenviable distinction of "Britain's saddest dog" - and for good reason. 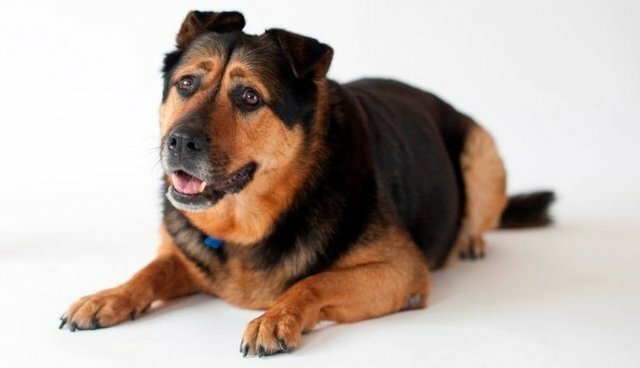 For the last five months, she'd been waiting to be adopted from the Battersea Dogs and Cats Home in South London, but because of the rather glum-looking expression she constantly wore, it seemed that nobody wanted her. "Bless has a mournful face but a heart of gold – anyone who meets her can't believe what a gentle giant she is," he said. "Although she looks sad she is an absolute joy to be around – that's why it's so sad for us that she's still in kennels rather than happily established in a loving home." But after the sad dog's sad story broke across the UK tabloid circuit, things began to look up. When Geoff and Sylvia Shoesmith read about Bless' troubles finding a home, they decided to giver her one themselves. And as it turns out, Bless isn't so permanently sad after all ... especially now. "She's fantastic, I can't fault her," Geoff says of his beloved new pet. "She's got that sort of face that never gives much away – but as soon as you put your coat on and it's time to take her out, then she positively bounces!" To learn about adopting a pet in need of a forever home, visit your local Humane Society or the ASPCA.